Apple cider vinegar is popular in folk medicine and used as an ancient remedy for treating a wide variety of conditions. Vinegar is a fermentable liquid. It can be made from a variety of carbohydrate sources, to include wine, apple juice, grape juice, and rice. Yeast ferments the naturally occurring sugars to form alcohol and then bacteria converts the alcohol to acetic acid. This process can take weeks to months, or longer. Apple cider vinegar is often seen with the "mother" at the bottom, which consists of bacteria and yeasts. It's to the "mother" most health professionals attribute the health benefits. Apple cider vinegar has been widely studied for its benefits on health, particularly with blood sugar control. A 2018 review article published in Journal of Evidence-Based Integrative Medicine found that consuming apple cider vinegar slowed the rate at which food left the stomach, keeping subjects fuller for longer periods of time. They also noticed small improvements in blood sugar control and how the body moves glucose to muscles. In most studies, the amount of apple cider vinegar used was approximately 2 tablespoons. There is not enough research to indicate whether or not apple cider vinegar can help you with weight loss. If drinking vinegar helps you feel fuller longer, water may have the same effect. As for right now, vinegar should not be your choice for a weight loss drink. 2 tablespoon of apple cider vinegar with the "mother"
Apple cider vinegar is very acidic and can do some <ahref="https: www.livestrong.com="" article="" 113943-benefits-drinking-water-apple-cider="" "=""> </ahref="https:>damage to your teeth if you're swooshing it around. According to 2018 research published in Scientific Reports, apple cider vinegar has a pH of 4.2, and neutralizing it with sodium bicarbonate — baking soda — is an option to reduce the acidity. Diluting apple cider vinegar in water is the best option. Choose an apple cider vinegar with the "mother" for the best benefits. In one-half cup of water, 4 ounces, add 2 tablespoons of vinegar and 1/2 teaspoon of baking soda. Ensure the baking soda dissolves quickly and it may bubble up a bit, that's normal when mixing baking soda with vinegar. Drink the apple cider vinegar solution all at once and don't let it linger in your mouth to minimize the amount of time the acid stays in contact with your teeth. Drink another sip or two of plain water and swoosh it around your mouth to clear out any vinegar that may be on your teeth. 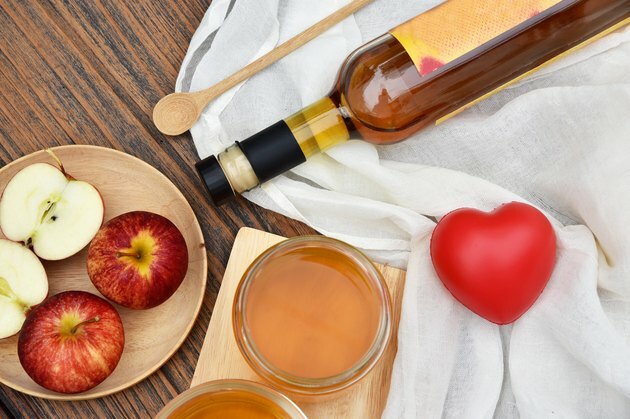 Drinking apple cider vinegar will not get rid of your heartburn, but it may make it worse, so start with small amounts to ensure you do not trigger unpleasant heartburn symptoms. There are instructions on most boxes of baking soda that recommend you not consume more than 7 one-half teaspoons in 24 hours, and no more than 3 one-half teaspoons if you are over 60 years old. By no means should you continually take a large dose of baking soda and it should never be given to children under 5. An article published in the Journal of Medical Toxicology indicated many adverse side effects with large amounts of baking soda being consumed. There are reports of death when baking soda was used as an antacid often and regularly. Those who abuse alcohol, are pregnant, taking diuretics, and those with heart conditions should speak with their primary physician before consuming baking soda. In addition, baking soda should not be consumed if the stomach is overly full from eating or drinking, as this could cause stomach rupture. It is best to adhere to package instructions for baking soda and not consume more than 2 tablespoons of apple cider vinegar to protect from tooth erosion. In addition, vinegar has the potential to react with laxatives, diuretics, and medications for treating heart disease and diabetes. Talk to your doctor before taking this remedy, especially if you have a condition that affects the heart, mouth, pancreas, esophagus, stomach or intestines. Journal of Evidence-Based Integrative Medicine: Diabetes Control: Is Vinegar a Promising Candidate to Help Achieve Targets?